Lose your Adobe Product Key? 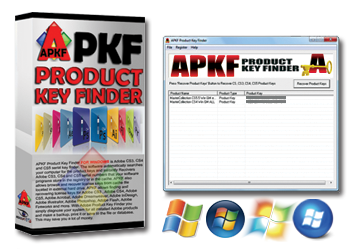 APKF is Adobe product key finder for Windows software for recovering product key ( CD key, serial number ) for Adobe Creative Suite CS6, Adobe CS5, Adobe CS4, Adobe CS3, Adobe Acrobat, Adobe Dreamweaver, Adobe InDesign, Adobe Illustrator, Adobe Photoshop, Adobe Flash, Adobe Fireworks and more. APKF allows browse and recover license keys from cache file located in external hard drive. With Adobe Product Key Finder you can simply diagnose your system for all installed Adobe products, find Adobe serial numbers and make a backup, print it or save to the file or database. You can backup recovered Adobe product keys and save as Tab Delimited Txt File (.txt), CSV Comma Delimited (.csv), Excel Workbook (.xls), Access Database (.mdb), Web Page (.html), SQLLite Database (*.db) or XML Data (.xml) file, print key list or copy all to clipboard. How Do I Find My Adobe Creative Suite CS5 Serial Number? With APKF you can find and recover your Adobe Adobe Creative Suite CS5 serial number. How Do I Find My Adobe CS5, CS4, CS3 Serial Numbers From MAC OSX? APKF for MAC automatically searches your computer for the Adobe CS5, CS4, CS3 product keys and serial numbers.